Aston Martin will take a version of its V12 Vantage supercar racing next year in the guise of the Vantage GT3, giving 10 customers a 600-hp track beast. The differences between the race version and the roadgoing one include upgraded paddle shifting, optimized electronics and a target weight of 2,755 lbs from its al-u-min-yum frame. 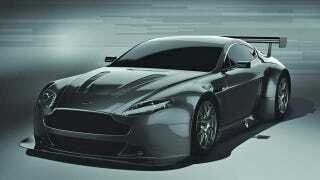 It'll replace the valiant DBRS9, while keeping Aston's race car lineup five models strong.